An event occurred during December that brings five specific preferred stocks, currently providing a yield of 7.12%, to the top of the opportunity list for preferred stock investors. These are just the sort of circumstances that preferred stock investors are interested in but frequently find too time consuming to dig out. One of our largest real estate development companies closed a deal worth nearly half a billion dollars that they have been angling for since 2007. And that's just the construction budget. The contract also includes additional consideration for the ongoing operation of the resulting facility and its infrastructure. Take a look at Table 1. 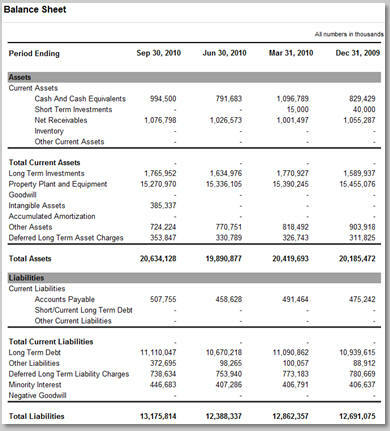 This is their Balance Sheet ending September 31, 2010. This company's assets almost double its liabilities and those assets include about $1 billion in cash plus another billion in accounts receivable. Looking at the data for the last four quarters you can also see that this is not the exception; this is how management runs this business and has for a long time (this company was first incorporated in 1936). This company is also the issuer of five of the highest rated preferred stocks on the planet, all currently trading for under $25 per share (more on why this is critically important in a moment). As itemized in Table 2, these five investment grade preferred stocks are offering an average annual dividend yield of 7.12% right now. 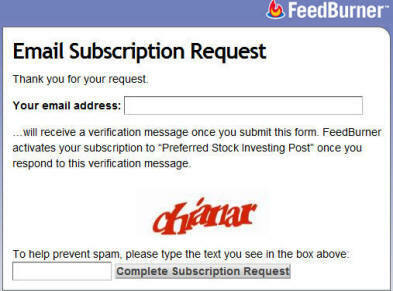 (Note that to protect the value of subscriptions to the CDx3 Notification Service, my preferred stock email alert and research newsletter service, actual trading symbols are omitted here). These five issues all carry the 'cumulative' dividend provision as well. That means that in the unlikely event that the issuing company has to skip a dividend payment to you (which has never happened with this company) they still owe you the money. With cumulative dividend preferred stocks the issuing company's obligation to pay you accumulates. $25.00 per share is a magic value for investors looking to add an additional layer of protection between risk and their invested principal. Five years after a new preferred stock is issued the issuing company regains the right to purchase your shares back from you. If they do so, they must pay you $25.00 per share. So by purchasing your shares for less than $25.00, you not only help protect your principal but you also position yourself for a nice capital gain in the event the issuing company retires the shares in the future (see the Special Announcement article below to read about how preferred stock investors can use this technique right now with Big Bank-issued preferred stocks courtesy of the new Wall Street Reform Act). 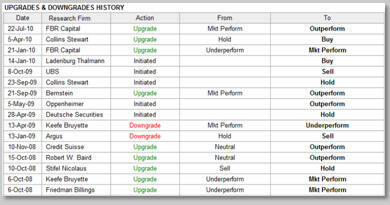 As shown in Table 2, all five of these preferred stock issues are currently available for less than $25.00 per share. Over time it is not unusual for the same company to issue multiple "series" of preferred stocks, each with its own prospectus provisions, characteristics and dividend rate. The five that you see listed here are very similar and were all issued not only by the same company but within twelve months of each other. Preferred stock buyers and sellers will tend to price similar preferred stocks from the same company such that the return (the "yield") is about the same. Looking at Table 2, notice that the average yield of these five issues is 7.12%. Notice that PFD-B is priced too high at the moment. At $23.56 per share, PFD-B provides a yield of 7.03%. Given that these five high quality preferreds are issued by the same company, are nearly identical and are almost the same age, buyers are getting more for their money with the other four issues. PFD-A and PFD-C are particularly attractive as these two preferreds have been slightly under priced by the market, a condition which is always temporary. The foreseeable future of this company appears to be very encouraging, especially for preferred stock investors. This company's common stock dividend provides a current dividend yield of only 3.2%. That's less than half of the 7.12% average being paid by this same company's preferreds. The irony is that, since preferred stockholders get to stand in line in front of common stock holders in case of a disaster (hence the name "preferred"), the investment risk associated with these five preferred stock issues is less than that associated with this company's common stock. And that's before you consider the investment grade ratings and the cumulative dividend obligation that these five preferred stock issues also provide to investors. A rare example of higher returns at lower risk. Subscriber's to the CDx3 Notification Service, my preferred stock email alert and research newsletter service, can read more about this company, their new big deal and see the trading symbols for these five high quality preferred stocks in the current (January 2011) issue of the subscriber's newsletter, CDx3 Research Notes. The January 2011 issue of CDx3 Research Notes includes four pages of research on these five preferred stocks and how subscriber's to the CDx3 Notification Service can keep a close eye on them and their performance using a new tool just launched on the subscriber's exclusive website. The extent to which these preferred stocks are consistent with your individual risk tolerance, financial resources and goals is a decision that only you can make. But this is just the sort of opportunity that piques the interest of many preferred stock investors. This month there are 18 preferred stocks offered by our Big Banks that provide a potential layer of principal protection not available with many other preferred stock issues. This table presents an updated list of Big Bank-issued trust preferred stocks (TRUPS) that will be among the first affected by section 171 of the Wall Street Reform and Consumer Protection Act, signed into law on Wednesday, July 21, 2010. If you've never been to a Wells Fargo museum you're missing out on a unique glimpse of U.S. history. Founded in 1852 as a safe place to put California gold, Wells Fargo has grown to a $165 billion financial powerhouse, still headquartered in San Francisco. In October 2008, the bank was one of the original nine TARP banks that were required to volunteer to accept $25 billion each, ostensibly, so goes the rumor, to provide cover for Citi. While objecting, Wells took the TARP cash to the delight of financial analysts. After having done their part to prevent a global run on Citi, Wells repaid Treasury a year later. Wells is one of the most watched and analyzed banks in the world with no fewer than 28 financial analysts scrutinizing its every move. 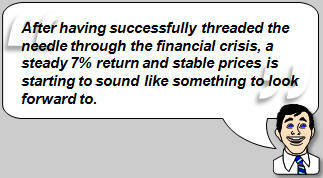 Since the financial system recovery in early 2009, these analysts have provided the company with a string of upgrades. Wells is consistently mentioned among the most favored and well run financial institutions in the world. During the financial crisis (2007 - 2009) we saw stronger banks acquire their weaker competitors for, in many cases, bargain basement prices. JP Morgan and US Bancorp proved particularly nimble and have both benefited accordingly. On January 1, 2009, Wells, for their part, completed their acquisition of Wachovia. Too frequently such acquisitions run into rough water due more to cultural and leadership friction than anything more material. In a testament to both organizations, Wells earned the highest American Consumer Satisfaction Index score in customer satisfaction among Big Banks. The study, conducted by the University of Michigan Ross School of Business, is published every quarter with these most recent results being announced on December 14, 2010. Learn more about Wells Fargo & Company: Company website | Profile | Upgrades/Downgrades | Recent News. Why are preferred stocks considered lower risk than the same company's common stock? As pointed out in the beginning of my book, Preferred Stock Investing, all investment strategies have two assumptions in common - (1) that the entity being invested in remains a going concern and (2) investing is no place for next week's grocery money. 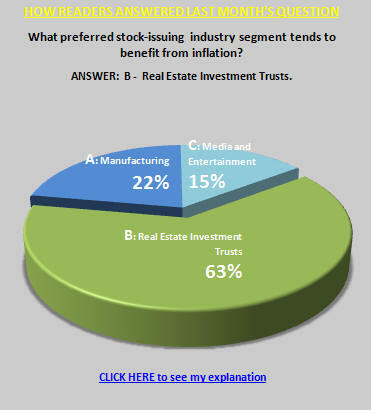 Preferred stock investing is no exception. Our returns are paid to us by the issuing company and, since market prices go up and down repeatedly over time, you do not want to be in a position of being forced to sell when prices are lower than when you made your original purchase. And investment risk is often very difficult to quantify. That is, it can vary from one investor to the next. What is acceptable risk to one investor may be unacceptable to another. But for some very specific reasons, the same company's preferred stocks generally carry less investment risk than their common stock. The question this month for preferred stock investors: Why are preferred stocks considered lower risk than the same company's common stock? The correct answer to this question is (E), all of the above. Let's take them one at a time. Preferred stockholders get paid their dividends before common stockholders: This is why they are called "preferred" stock; preferred stock shareholders have preferred status over common stock shareholders. A company cannot pay their common stock shareholders one dime in dividends until all preferred stock dividends have been paid out. Prices are less volatile since the dividend is known in advance: Market price fluctuations are caused by speculation; the more unknowns, the more speculation. Since the dividend paid on a company's common stock (if any) can vary every quarter, there is substantial speculation at all times. Preferred dividends are generally of a fixed amount and are known in advance so preferred stock market prices are generally less volatile. Preferred dividend payments are less tied to quarterly profits: Common stock dividends are a distribution of quarterly profits, if any, to shareholders. Preferred dividend payments are generally reserved in advance since the amount is known and are therefore more closely tied to the company's cash flow than to quarterly profits. Common stocks have no par price below which principal is more protected: Preferred stocks can be "retired" by the issuing company. To do so, the company must buy the preferred stock shares back from shareholders at a pre-declared price called the "par value" (usually $25 per share). Investors can therefore reduce the risk of principal loss by always purchasing their shares for a market price less than the par value. Common stocks have no such provision (and no such "built-in buyer"). 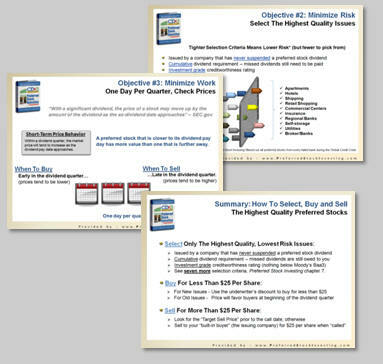 While my book, Preferred Stock Investing (now in its third edition), describes a variety of reasons why many investors find preferred stock investing more attractive than common stocks, these four risk reduction aspects of preferred stocks are particularly compelling. Add to that their long-term average annual dividend yield of about 7% (compared to 4% for common stocks over the last century, closer to 2% since 1990) and, for many investors, the case for preferred stocks becomes hard to ignore. As a new year gets underway preferred stock investors find themselves once again wondering when the Federal Reserve is going to start raising interest rates. Historically, the direction of the federal funds rate and the yield being generated by other fixed-return investments (such as preferred stocks) tend to move together. While the 7% yield currently being provided by the highest rated preferred stocks is attractive to many, an increase in the federal funds rate could produce a yield uptick for preferred stock investors. But if Jan Hatzius, chief U.S. economist at Goldman Sachs, is right, preferred stock investors will be enjoying their 7% dividend returns for another two years. In a January 3, 2011 CNBC interview Hatzius says that the Federal Reserve is unlikely to increase the federal funds rate until 2013. He goes on to say that until employment picks up (which no one is expecting any time soon), we should not be too concerned about inflation either. While 2010 saw a return to normal for preferred stock investors, 2011 could be a year of stability if Hatzius has it right. After having successfully threaded the needle through the financial crisis, a steady 7% return and stable prices is starting to sound like something to look forward to. Opportunities that preferred stock investors should keep an eye on going into 2011: instability in the municipal bond market, China monetary policy, healthcare legislation changes and what the Fed does, if anything, about QE2 as we approach summer.